Decided not to get the train in the end as the fare would have eaten a chunk of my stash money. So in my ultimate wisdom I drove. Not a good idea with my recent state, so broke the journey up with stops at mothers in Sheffield; left on thursday, back a few hours ago. Frazzled. Man, we had a great time! Seriously tiring though, as the schedule was non stop and I couldn't get enough sleep, what with strange beds, a resident snorer and non stop minibus to yarn store shuffling. Met loads of new faces as well as familiar ones. Spent most of the weekend hanging with Fred, Sue (s) & Blueadt - much fun had. Had the camera with me but kept forgetting I had, so only managed photos near the end of the weekend. Doh. So shall cheat and link up to a couple from Lixie's blog. Read this post for a snap of the youth hostel we stayed in. Amazing building. Got a little chilly at times, so rather glad a sleeping bag was in the car. On the same post you'll also find a photo of Alex with the resident cat (a male version of Spook!) wearing her HexHat. Oh yeah, Alex fell in love it and bought it on the first night. Completely suits her, don't you think? The workshops were good fun, particuarly the spinning one with Nic.... gave me a chance to get to grip with those pesky drop spindles. The techniques taught were PluckFluff style yet I managed to walk away from mine without taking a photo. Now that I have learnt that I can use a weighty bottom whorl spindle, am all set, being as Hand Spun Revolution has been sitting on the shelf for sometime. Also spent a fair bit of time chatting to Isabella about travel spinning wheels, and have now fallen in love with a Louet S40, which of course has been discontinued. Typical. Saturday was action packed, stopping at Coldsprings, The Skep, Bombay Stores and finally the Knitting & Crochet Guild (oh, should I have also mentioned that myself, mum & Sue stopped off at Texere on friday before the official start of the weekend?) Purchases made in all places, but lots in the KCG. 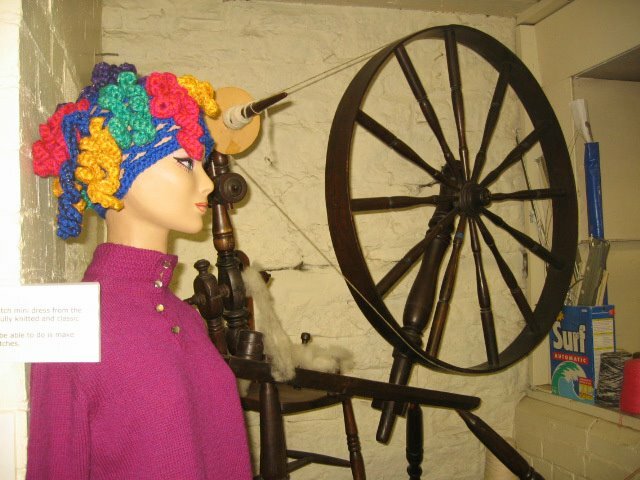 The 'yarn mountain', where donated yarns were selling for a penny a gram was a little gem. 3.5kg of pure wool yarns, ranging from Rowan to undyed locally spun wool found it's way into my bags. Rock on. Bought Unexpected Knitting & A Second Treasury of Magical Knitting too, alongside a couple of hooks. 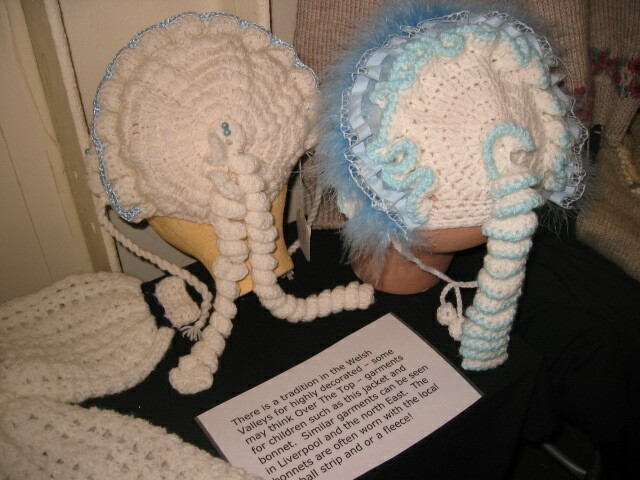 One thing I did remember to take my camera out for was the Guild's collection of knitted items, particuarly their hats. Obviously. Sunday saw a trip to Winghams. Ahhh, the ever wonderful Winghams. Prior to this particular shopping spree, virtually all weekend purchases had been bought for 1p a gram, with a couple of expensive ones at 2p a gram. Shopping for fleece and fibres was a different story though. Still, did well for my money and managed to find another hat to photograph. Bought a rather nice drop spindle, too. I won't disclose exactly how much money I spent in total, yet will say it was one of the biggest bank busters of the possie. Came home with a staggering 12kg of wool, sorted into 3 sacks - for spinning/felting, for dyeing and 'ready to knit'. All of it is stock for making hats, except 200g of black angora that cost me £10. Read it and weep. A tenner. Not sure what to make with it yet, but am sure inspiration will strike me at some point. 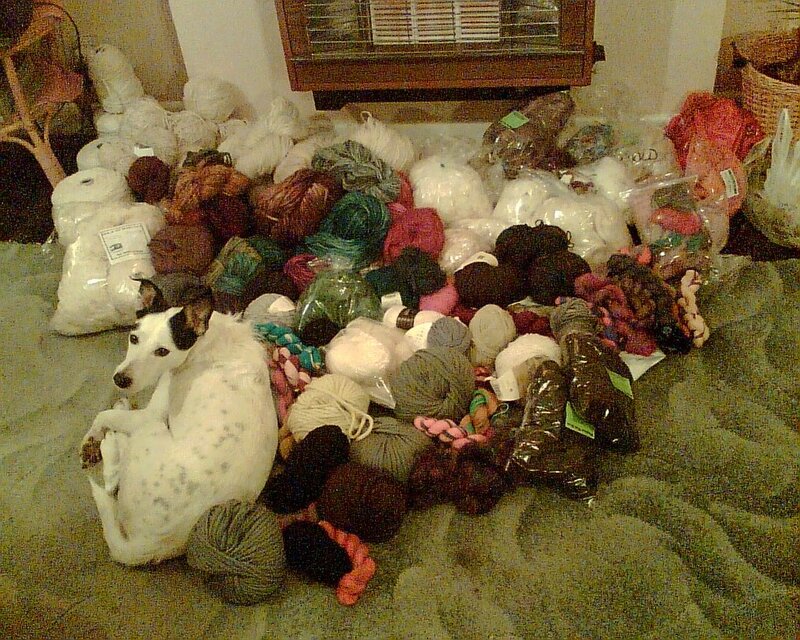 Coming home to a messy flat hasn't helped my stash organisation yet that'll be my job tomorrow (or whenever I wake up) Meantime, here's a snap of my mum's dog, Taz, getting comfy with it all when it was on show in Sheffield. 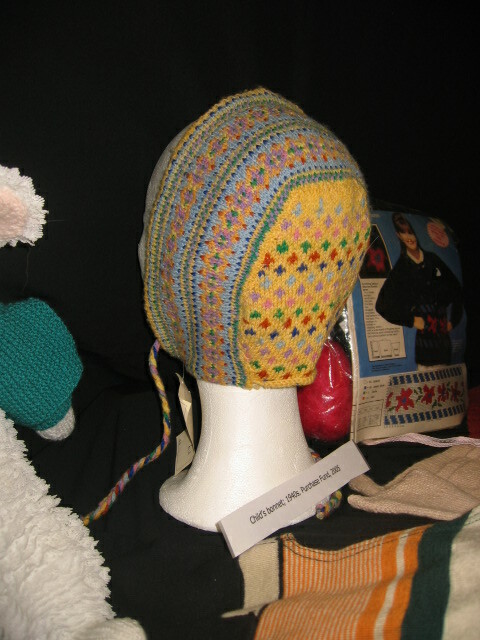 There was some experimental hats being created as we dashed around, not yet finished though so will post as soon as. More photos will be posted on the SkipNorth site, so check in later in the week. Kinda feel like writing a proper post with even more details and photos... maybe another time as sleep is due now. Managed a couple of hours as soon as I got home but think a solid 2 days may make up for the weekend ;) Seriously folks, tag along next year, you won't regret it. If I'm still in the country I'll be going for sure. A brilliant time; shopping, knitting, sharing skills and tips and the joy of bunk beds. Cheers to Alex and Nic for organising this.